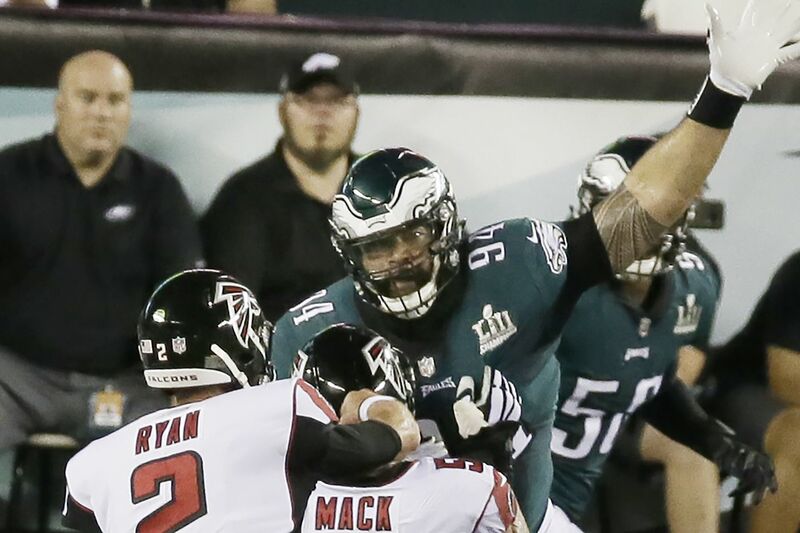 Haloti Ngata, here trying to break up a Matt Ryan pass, will not play Thursday night. The short week is leaving the Eagles short on numbers for Thursday night's game against the New York Giants. The Eagles will play without linebackers D.J. Alexander (quadriceps) and Nathan Gerry (ankle, knee), safety Corey Graham (hamstring), defensive tackle Haloti Ngata (calf), and running back Darren Sproles (hamstring). All five players were declared out Wednesday. This is second consecutive week that Ngata is out. Destiny Vaeao will be the No. 2 defensive tackle, and the Eagles will likely use Treyvon Hester and T.Y. McGill in their defensive tackle rotation. McGill joined the team Monday. Sproles will miss his fifth consecutive game. The Eagles will use Corey Clement, Wendell Smallwood, and Josh Adams at running back. DeAndre Carter will return punts. Graham is absent for the first time this season. He injured his hamstring last week. Deiondre' Hall is the Eagles' third safety. Alexander and Gerry both were injured last week. LaRoy Reynolds is the Eagles' only reserve linebacker. With five players out, the Eagles will dress one of the three offensive linemen they usually keep inactive: Chance Warmack, Matt Pryor, or Jordan Mailata.